A Scottish poetry pamphlet publisher based in rural Aberdeenshire. The Tapsalteerie stall is coming to a Dundee near you on the 26th of this month. Get yersel down there to get a hold of one of our limited edition copies of "Glasgow Flourishes" by Calum Rodger, which will be launched that day (or just pop by to say hello and hae a news about poetry!). There's heaps of really inspiring and excellent exhibitors there too, so if you're about in Dundee for the festival we'd really recommend making your way to the Bonar Hall on the Sunday. 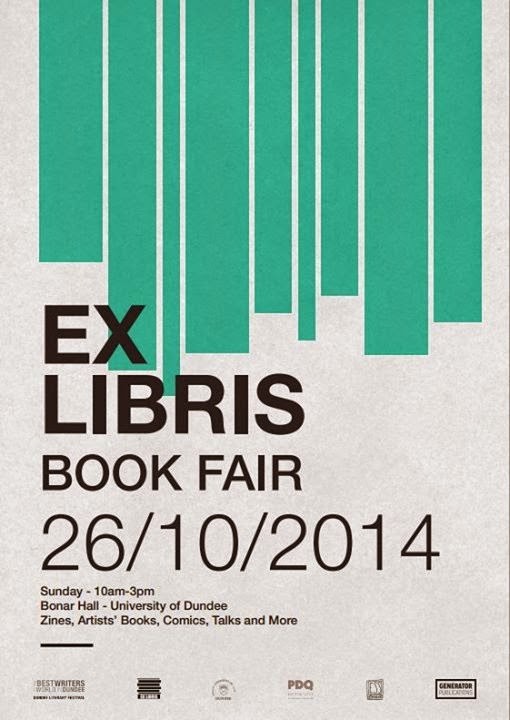 Find out more on the Ex Libris Wordpress site. And a tip of the Tapsalteerie hat to the designers of the poster too. Splendid! We're delighted to announce that our latest publication, "Glasgow Flourishes" by Calum Rodger, will be released at the end of this month. It's our first ever hand-bound publication, trimmed, folded and sewn together by Tapsalteerie's own fair hands. It's just a short wee pamphlet, coming in at 16 pages and consisting of one poem only. Calum wrote it for his appearance at the recent TedX Glasgow, which you can see here. His performance and the poem itself really is electrifying; we highly recommend you give up five minutes of your time to watch him do his stuff. "Glasgow Flourishes" will be published on Sunday 26th October and will be first available through our stall that day at the Dundee Literary Festival's "Ex Libris" book fair. Note that we're only doing a limited edition of 60 copies, each one hand-numbered, so get in there quick if you want one! We're also currently working with some affa weel-kent writers to produce a compilation of Baudelaire's prose poems in Scots, scheduled for release at the start of next year. The details are only getting finalised at the moment, so we can't say too much more about it just now, but watch this space (as well as our Facebook and Twitter feeds) for more info and sneak previews as they arise. The latest edition of Northwords Now has some very kind words to say about Tapsalteerie in their review of Tom McGrath's "Sardines", which is described as "an inspired way for a new book producer to break into the Scottish poetry scene". Skip to page 22 if you want to read the review but, of course, we'd encourage you to read the whole magazine if you haven't already. And finally, we've launched a new YouTube channel, through which you can watch readings from our poets as well as a few other things that tickle Tapsalteerie's fancy. We'll be building up the content as the months go by so do keep checking back. Yesterday the National Collective released a letter signed by over 1,300 artists in support of Scottish independence, with unsurprisingly strong representation from the Scottish literary world. I signed it (Duncan Lockerbie), as did Tapsalteerie poets' Bill Thom (The Quait Chiel) and Calum Rodger (Know yr Stuff), as well as Alice McGrath, who we worked with to republish Tom Mcgrath's Sardines. The letter is an important contribution to the debate, much more so than the opinions of celebrity A or celebrity B, or whoever it is that campaigners have decided to wheel out in support of their viewpoint this week. The letter shows a genuinely strong level of support for independence from people who live, work and create in Scotland. It shows that independence is not just for "nationalists" or, if it is, then it's not in the same sense and with the same connotations that the term "nationalist" usually carries. Support for Scottish independence doesn't come at the expense of other races, cultures or nations. In fact quite the opposite: for many an independent Scotland is an oppportunity to build a more inclusive, fairer and equal society, regardless of who people are or where they come from. The fact that so many artists have signed this letter shows that independence would certainly not be, as Will Hutton put it in a Guardian column this weekend, "the death of the liberal enlightenment before the atavistic forces of nationalism and ethnicity". Quotes like that, and sadly the opinion is shared by many, show a lack of understanding of the variety of motivations for supporting independence. It also betrays a lack of engagement with the people at grassroots level who have been pushing for it. So far I've kept Tapsalteerie out of the debate. We're publishers, not political campaigners, and there are people more expert than us who'll do a much better job at that kind of thing. But as a fledgling publisher, one of the few who publish Scots language writing, and as somebody with a - very modest - part to play in the cultural life of Scotland, it would simply be weird for me not to not say anything at all. Especially considering the role that writers have played in developing ideas of Scottishness, as well as my role in helping Scottish writers make their work available to the public. We believe that Scotland can and should be an independent country. We believe that Scottish culture will flourish come what may, but that political independence will give the people of Scotland the opportunity to build a better country, both socially and politically. We believe that our culture is shaped by how we choose to conduct politics, and that democracy is better served with power closer to home. We believe that with independence the people of Scotland and their elected representatives will be able to address the issues Scotland has to face as a nation. We understand there are uncertainties. We embrace them. We understand that a yes vote is not a panacea to solve all Scotland’s ills. We are not voting yes because we think Scotland is better than other countries. We are voting yes because we believe it is equal to them. We are voting yes because we have imagined a better country. Now, we want to build it. See more, including the full list of signatories. "An inspired way for a new book producer to break into the Scottish poetry scene... a collection full of voices you’ll recognise, but won’t read in books from the mainstream poetry publishing houses." 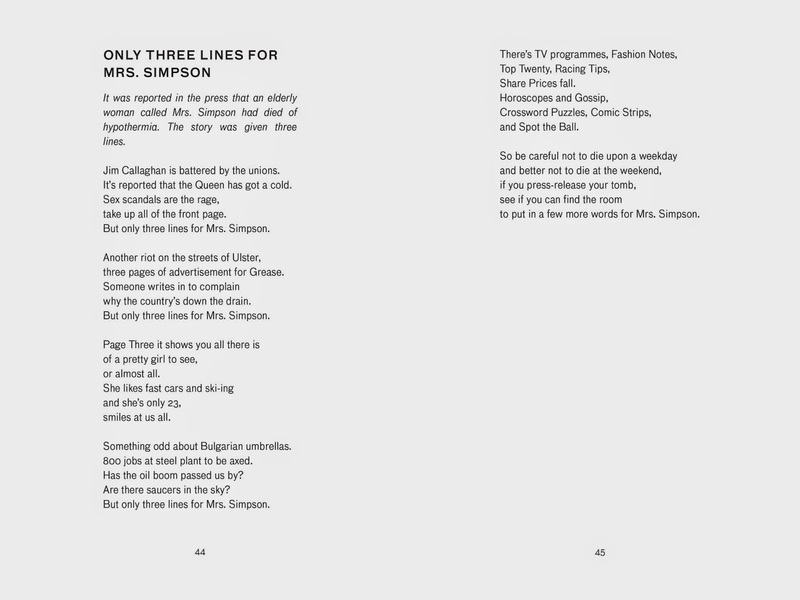 She goes on to quote directly from one of the poems called "Only Three Lines for Mrs Simpson". In celebration of receiving such a nice review in one of the top Scottish literary periodicals we've decided to reproduce the poem in full here. Hope you enjoy it! Tapsalteerie poet Calum Rodger will be hitting Aberdeen on Saturday 26th July for a whistlestop tour of the city's finest literary showcases. Lined up first is an appearance on the Literature Show, SHMU FMs weekly broadcast on writing from Aberdeen and beyond. The show has become something of an institution nowadays after going strong for a number of years, with the list of previous guests reading very much like a who's who of the north-east's literary scene. The show starts at 6pm; you can listen live online or, if you miss it, listen again through the show's mixcloud page. Tapsalteerie do have previous on the show - I appeared with Bill Thom last year to chat about Tapsalteerie's first publication, the Quait Chiel. You can listen to that again too of course (well worth an hour of your time!). After the literature show it's onwards to Per-Verse, the new incarnation of what used to be called Demented Eloquence, Aberdeen's foremost spoken word night. If you haven't been to one of these nights before then it's highly recommended you do so, there's always a great atmosphere and Cellar 35 is a perfect wee venue for it. Calum will be reading from "Know yr Stuff: poems on hedonism" in support of Richard Tyrone Jones who'll be previewing his Edinburgh Fringe show. Pick up copies of Bill's excellent pamphlet via our bookshop.